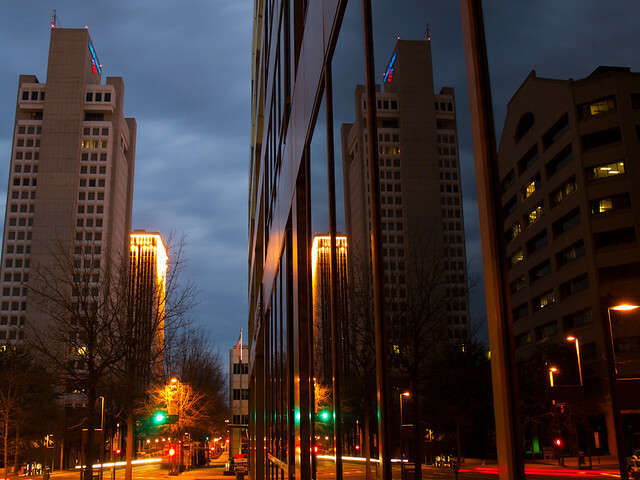 Before the storms and earthquakes hit Arkansas yesterday, I decided to make a short visit to downtown Little Rock in an attempt to get a few pictures. 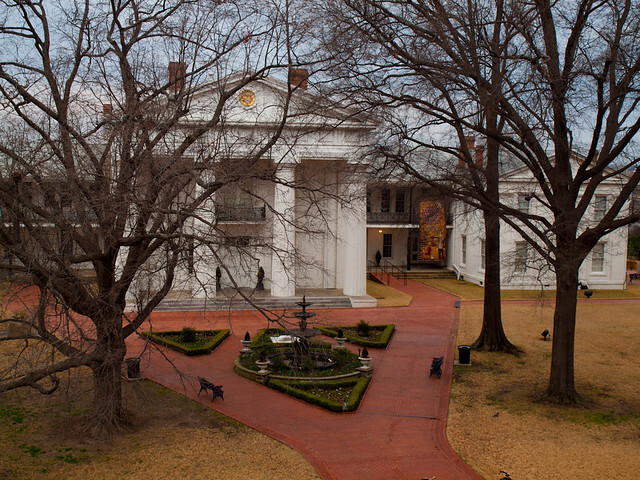 Somehow, each picture that I'm posting now is somehow involved with the capitol. I didn't plan that at all, but I'll pretend that it's all some sort of brilliant idea. Capitol shot #1 is a bit obvious, since it's the actual State Capitol. I was surprised to see that it was open, being a Sunday afternoon. So I headed inside, where the building was empty and eerily quiet. The only other people in the entire building were two Capitol Police officers, who were sitting bored in their little office. 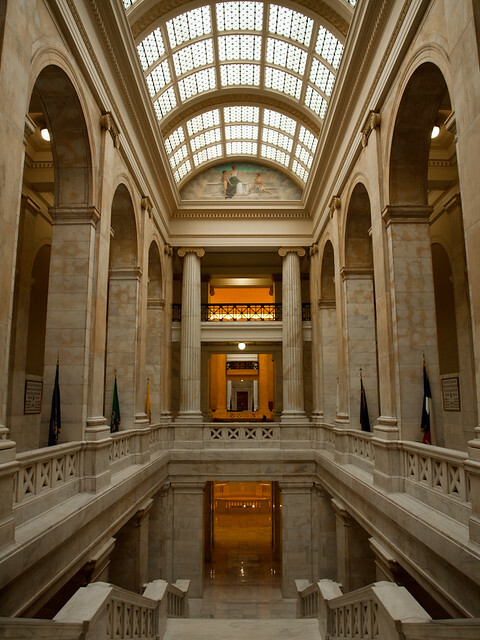 I went to take a few pictures, the shutter echoing off of the marble hallways. 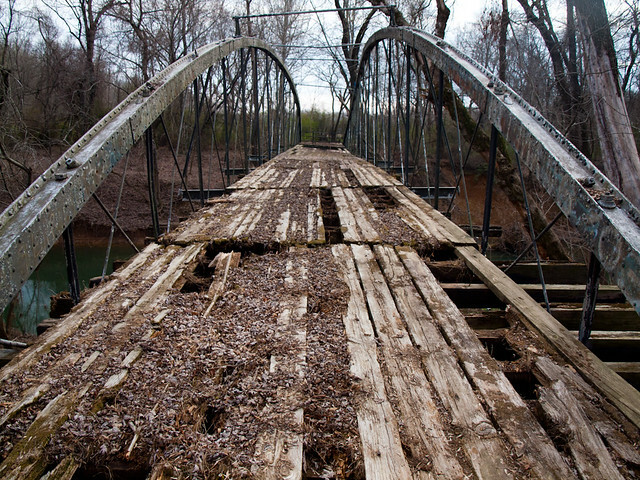 The Springfield Bridge is the oldest vehicular bridge in the state of Arkansas. It was built way back in 1874, actually a bit before the first car was introduced. 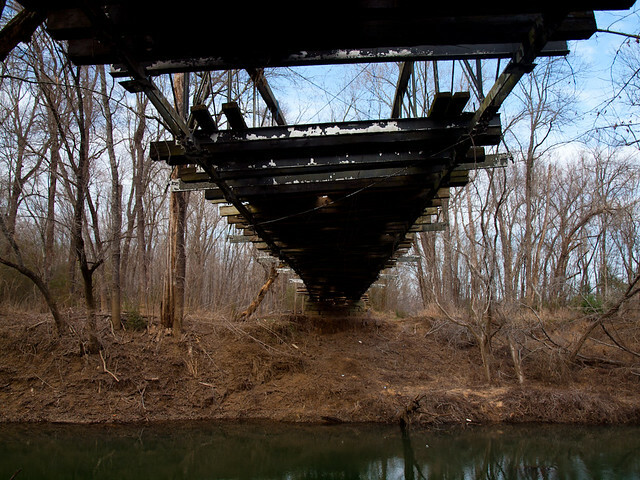 The bridge remains as a sweeping structure, with two steel arches curving gracefully over Cadron Creek. 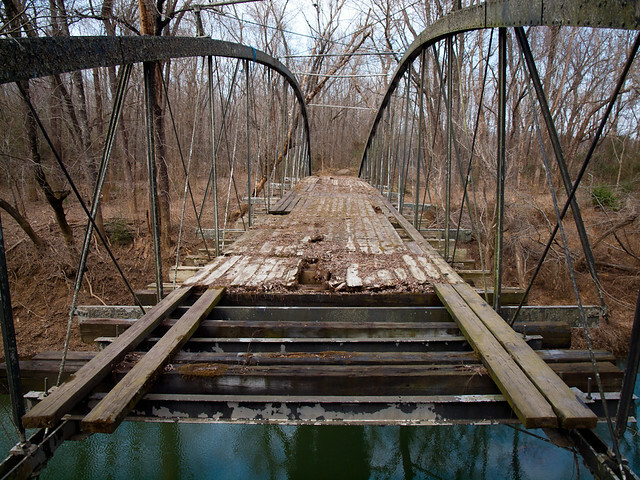 It is the last remaining 19th century cast and wrought iron bowstring arch bridge in the state, and one of only three of this type of bridge remaining in the entire country. Construction on the bridge was completed on July 21, 1874. The cost was a total sum of $12,857. The bridge was replaced by a modern span in 1991, which lies about 400 feet upstream from the old bridge. 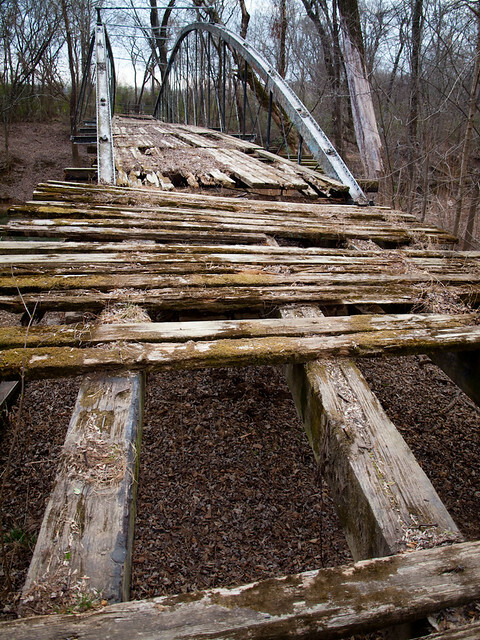 The bridge sits along the border between Faulkner and Conway Counties. When you visit it now, it seems like it sits in the middle of nowhere. But way back when the idea for the bridge was proposed, the nearby town of Springfield was the county seat of Conway County. Shortly before the bridge was built, however, the county seat was moved to the town of Lewisburg. Later on, in 1883, the county seat would be moved again to Morrilton. The area around the bridge is surrounded by farmland and fields. 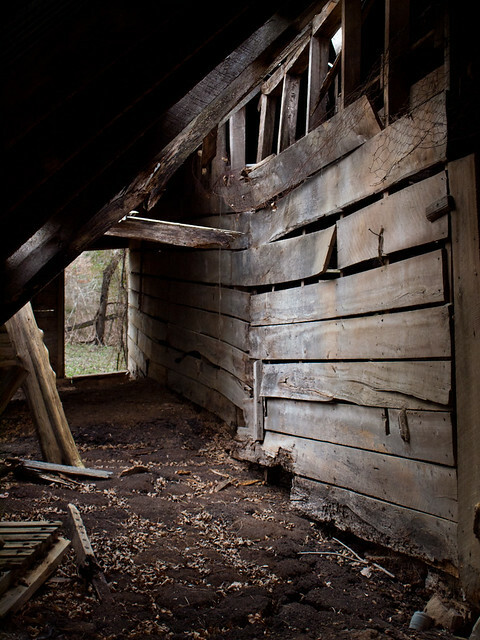 There are a few homes out there, but also several abandoned homes and barns. 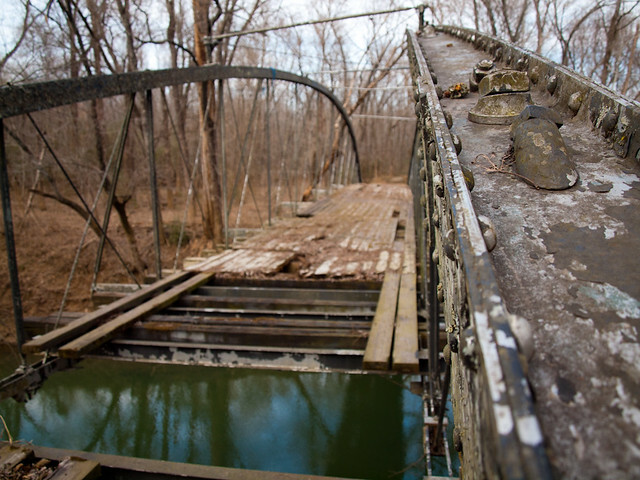 The bridge sits in a lonely stretch of woods, and it does feel a bit forlorn to visit there. Trash and litter sit along the main road near the old bridge, which isn't a fitting welcome to what is a truly historic spot in the state. On this visit, I met Zack in Conway and we made the short drive up to the bridge. It is pretty easy to get there, we traveled north out of Conway, through the amusingly named towns of Wooster and Bono (a town, which I assume, is where the streets have no name). We parked along the main road, near the new bridge, and got out of Zack's jeep. We were immediately welcomed by several loud bangs, apparently someone was shooting guns nearby. The two guys had holstered their guns when we approached. They were older, and they said that they lived nearby. We had a polite conversation with them about the history of the bridge. Eventually, we decided to leave and come back later. As we left, there were more loud bangs as they decided to start shooting again. 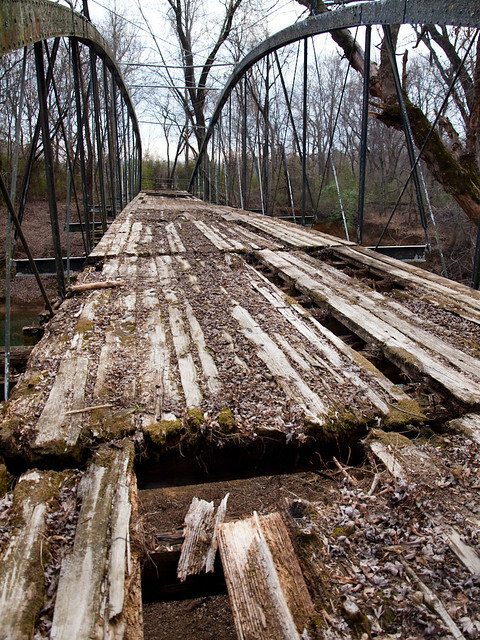 It's a bit of a shame to see the bridge in this kind of condition. It would be awesome if the bridge was preserved, and maybe even be the centerpiece of some sort of park. But that will probably never happen, since the area here is remote. There's no telling how much longer the bridge will be around. There is a large dead tree standing a few feet from the bridge. When that tree finally decides to topple over, it will probably land on the old bridge and destroy it. 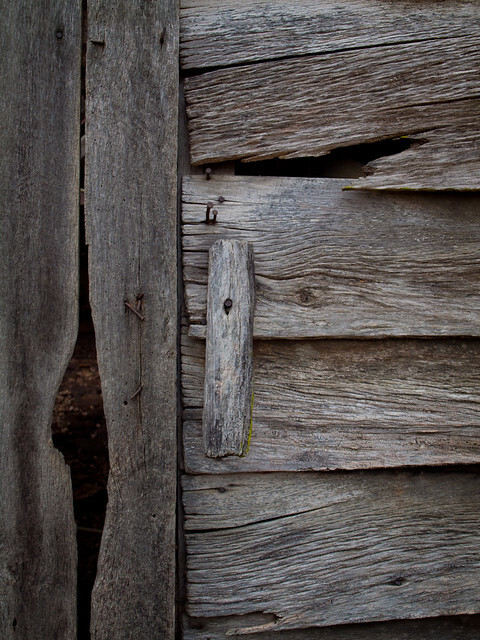 This is some of the detail of the weathered wood on the barn. Beyond the gap in the wood here, part of the wall had collapsed. 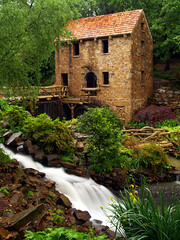 The Old Mill is the iconic structure in North Little Rock. It was never an actual mill - instead it's a gigantic sculpture. The mill was built as the centerpiece for a park, a novel setting that attempted to attract people to buy homes in the planned neighborhood that was to be built around it. The Mill was the product of Justin Matthews, who also developed the neighborhood of Park Hill in North Little Rock. He wanted a sort of tourist attraction to be the centerpiece of a new neighborhood, which would be carved out of the rolling hills to the west of Park Hill. 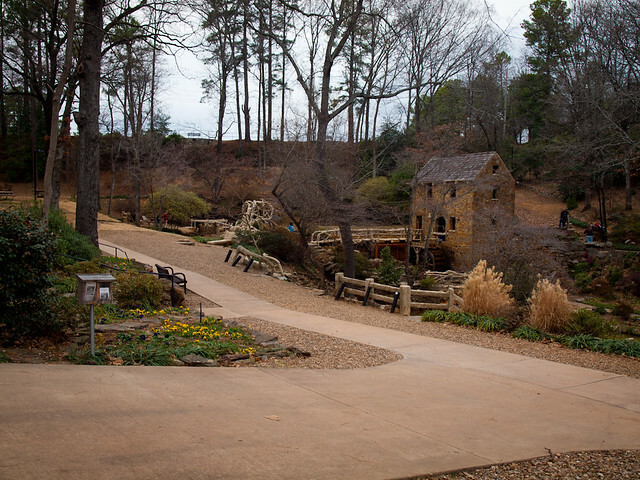 Matthews hired Mexican sculptor Dionicio Rodriguez to design and construct the mill, which would sit in a patch of land that was unsuited for houses due to its "rough and unsightly terrain." 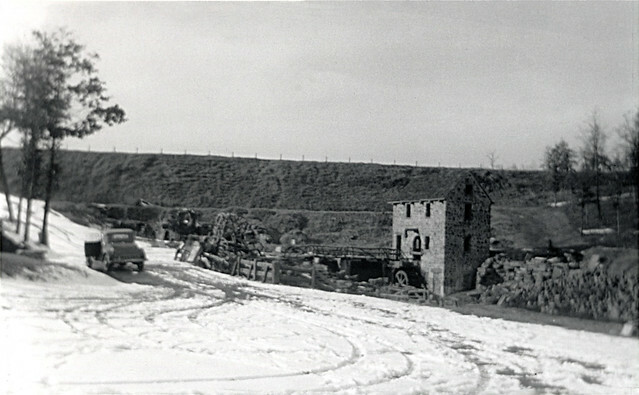 Rodriguez used reinforced concrete to create the mill building, and also the bridges around the park. The concrete was sculpted in a faux bois style, so that it was made to resemble wood. Even when the mill was new, it was designed to look old. The idea was to create a place where even Rip Van Winkle would feel at home (a claim used in an ad that appeared in the Arkansas Gazette). Even now, all these years later, it's still a popular place to visit. 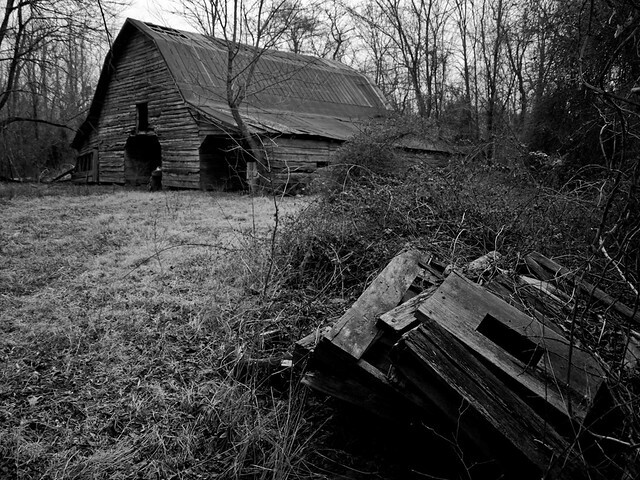 The picture I'm going to use for the "before" view of the Old Mill is one that is particularly close to me. It was actually taken by my grandfather, Mr. John H. Crossman, Jr. He was a young man then, about 20 years old. I think he took this shot back in the winter of 1934. It looks like there is a layer of snow on the ground - you can see tire tracks in it. I wonder if my grandfather was doing do-nuts there in the foreground before parking the truck to get out to take pictures. When I went to take the "after" shot, I wondered what must have been going through my grandfather's mind when he was taking the "before" shot. He would have been about 20 years old - did he wonder what his future would be like? A few years later he would marry his high-school sweetheart (my grandmother). A few years later, his life would change again, as he ended up being enlisted in the Navy during World War II, serving in Okinawa. In the 1950s, my grandparents bought a house. Their new home was located just a few blocks away from the Old Mill, in the development that was in Justin Matthews plans when he built the mill. My grandparents raised their three kids in that house. And a little bit later, that same house would see six grandchildren come through. One of those grand kids (my cousin) would actually have her wedding right there, at the Old Mill. Both of my grandparents were in attendance. 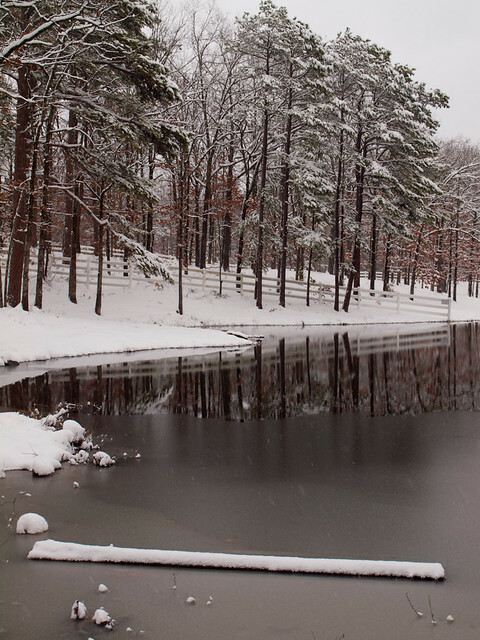 Surprisingly, we have had a lot of snow this year in Little Rock. The big storm that blew through town earlier this week dumped almost seven inches of snow here, which is a lot but not nearly as much as the 20 inches that fell on Fayetteville. But the recent snow has helped to turn the winter of 2011 into one of the snowiest winters on record here. The most recent winter where we saw this much snow was way back in the 1980s. I do remember that one year when we got 10 inches of snow, way back when I was in the 3rd grade. The snow, and temperatures below freezing that prevented it from melting, resulted in us missing a few weeks of school. Good times, even if meant me missing weeks of important 3rd grade education, like learning how to subtract (I'll master that one of these days). 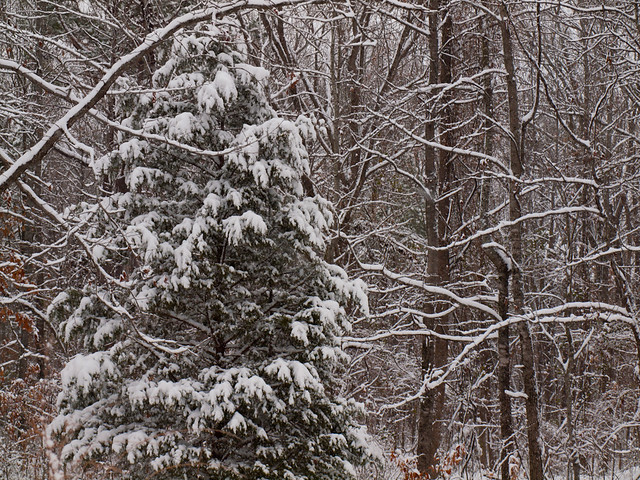 But the most recent big snow started last Wednesday afternoon. All the schools and most businesses closed down that morning, since the weather people were predicting massive amounts of snowfall. Everything was closed, of course, except for the place where I work. The office was open, so I drove off to work. When I cruised into the parking lot at 7:25am, the snow was already falling and sticking to the pavement. The snow quickly accumulated, so by the time the office decided to close at 8:15, there was already a inch or two of snow on the roads. So I was allowed to go home, after being at work for 45 minutes. The roads had quickly deteriorated into a messy state. Cars weren't able to drive up any hills thanks to a sheet of snow and ice. I was stuck at the bottom of a hill on Chenal Parkway, watching cars slowly climb up and then stop and slowly slide back down. I turned around, and managed to find a way out that wasn't blocked by stuck cars. After being at work for 45 minutes, it took me an hour and a half to get home (granted I did stop to buy beer on the way). The first stop was this stretch of woods, located adjacent to my apartment complex. The snow was several inches deep, but light and fluffy, so it wasn't a problem to walk through. I only fell down once while out taking pictures. The next stop was to visit a junk yard, which has hundreds of rusty and desolate looking cars parked there, seemingly forever. 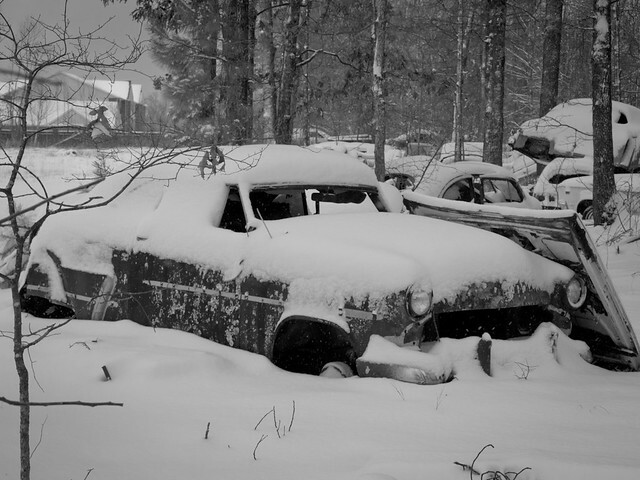 I stood at the fence and shot a few pictures as the snow piled on the relics in the old automobile graveyard. I've been wanting to get shots from here for awhile, but had heard that the old guy who lives there hates people nosing around his collection of rusting and decaying cars. The rumor is that he will come out and yell at anyone who comes close. I don't know if the stories are true, but I didn't linger too long, especially after hearing some warning barks from a distant guard dog. But perhaps that old man is just tragically misunderstood, like the old guy in Home Alone. I'd like to think that he would come to my aid when two burglars, who have already thwarted my elaborately staged hi jinks, are trying to break into my apartment when I'm all by myself. The next stop was the Park On The River, located on the edge of Maumelle. This is a neat little park, which runs by a small lake before running down to the edge of the Arkansas River. The snow was deep there, especially along the lake. 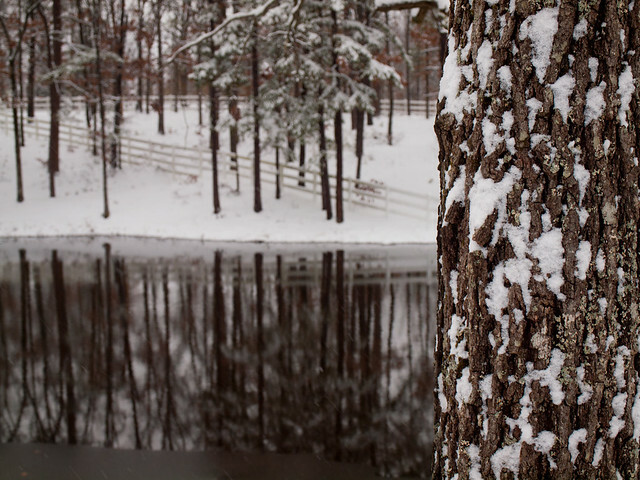 I went down and got a shot of the lake, part of which had a sheet of ice, and this snow-covered log. I was surprised to see another person out at the park, and I quickly assumed that it was a city parks worker. I asked him if it was ok to take pictures out there, since the park was probably closed because of the snow. He looked at me like I was crazy, and said, "sure why not, take some pictures." Turns out he didn't work for the city, and was just some random person who went out to look at the park in the snow. So I headed down the hill, where there are some picnic tables set up along the Arkansas River. 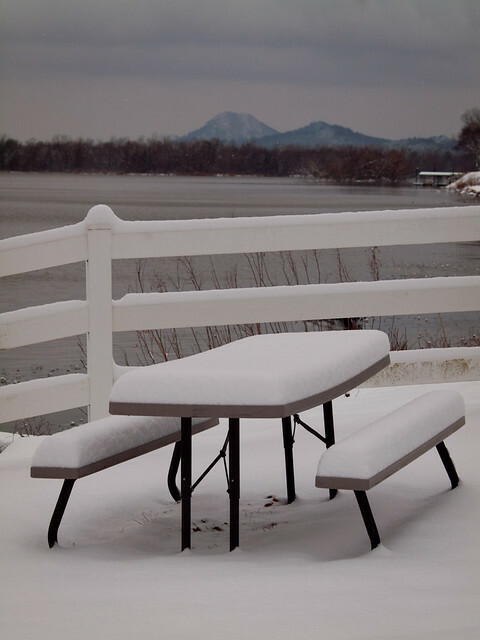 Here is a shot of one of the picnic tables, covered with snow, with Pinnacle Mountain in the distance. A few minutes later, a guy on a 4-wheeler drove by. He had a country music station playing on the 4-wheeler, and had a dog riding along with him. He stopped by where I was standing to say hi, and said that he wanted to take a ride with the dog in the snow. As I made my way back up the hill, I could hear the dog barking and having a good time in the snow. About halfway up the hill, I turned around and got a shot looking back towards the river. 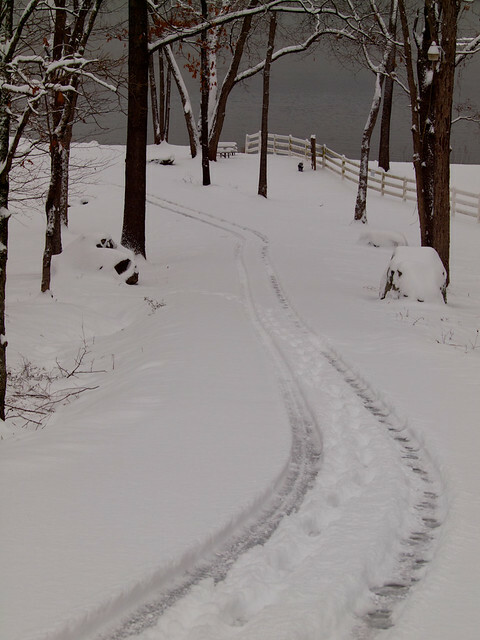 The tracks are from the 4-wheeler, and the footprints are ones that I made. Most of the snow as now already melted, and will be gone soon. Now the weather people are predicting highs up into the 70s in a few days.